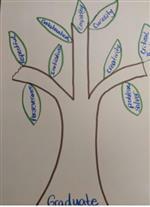 What are the hopes, aspirations, and dreams that our community has for our young people? 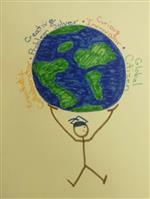 What are the skills and habits of mind that our children need for success in this rapidly changing and complex world? What is a Portrait of a Graduate? 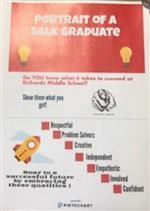 Fraser Public Schools has been asking our teachers, students, Board of Education, and community members to think about what a Fraser graduate should look like. 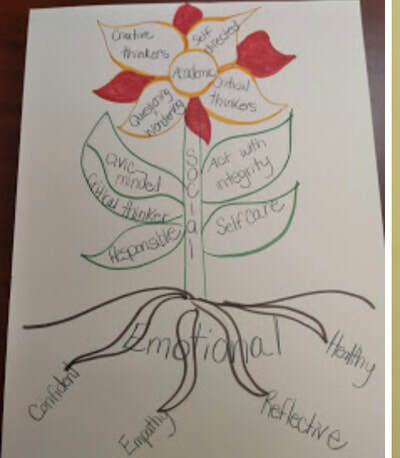 We want to develop a Portrait of a Graduate that defines what skills, attributes and experiences our students need for success after high school. This Portrait will clearly articulate what it takes to get the Fraser handshake at graduation. If you would like to learn more about the work that the district has done already, please click here. 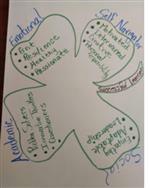 implementing collaborative plans that build on the exceptional work that has already occurred throughout the district. a clear focus on student learning and engagement. Implementation of a strategic Learning Model (Universal Design for Learning and Design Thinking) to increase student learning and engagement. We had a huge turnout for the Community Conversation held in April. 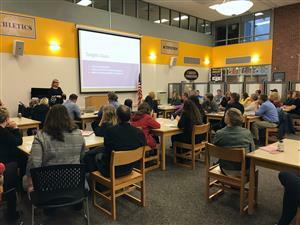 Superintendent Carrie Wozniak updated the community on the status of the Fraser Portrait of a Graduate and Strategic Plan. Guests were divided into small groups and shared their role in our Fraser Family. We had a mix of teachers, principals, parents, grandparents, graduates and even current students. Then, each guest wrote down what skills they hope all Fraser students will possess when they graduate. Next, they watched the video below of Apple co-founder Steve Wozniak and Harvard Innovation Lab expert Tony Wagner. The video talks about the role of the teacher, parent and schools in today's learning environment. Success is not just for those who memorize information. It is for anyone who wants to go out and get it, they said. 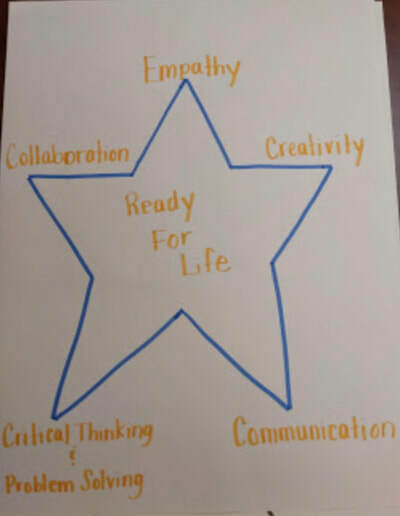 The six deeper learning competencies - Communication, Critical Thinking, Collaboration, Creativity, Character and Citizenship - will set individuals apart and provide the human element for success. Groups were formed for each competency, and guests shared how they could be incorporated in the classroom. The presentation from the event is below, and a complete wrap up will be included in the May Over the Fence newsletter. Conversation began with the Administration Leadership Team and the focus of our goals was set. Building principals brought the conversation to their teachers. 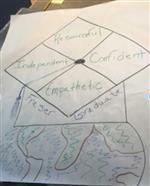 Together, each school developed a sketch of the skills and qualities they felt a graduate needed to have. 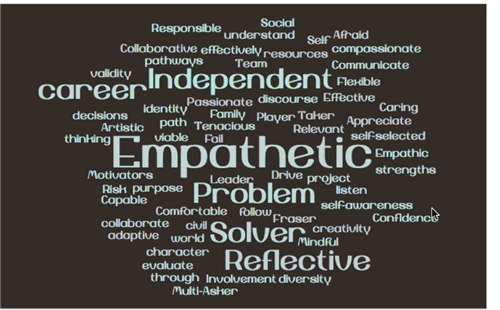 During a Workshop, our Board of Education then determined the key qualities they felt a graduate needed. Their responses were compiled into a wordle. 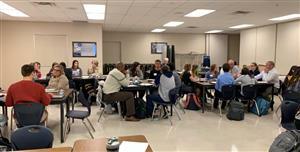 Next, Superintendent Carrie Wozniak and other district and building leaders met with a group of students at Fraser High School. 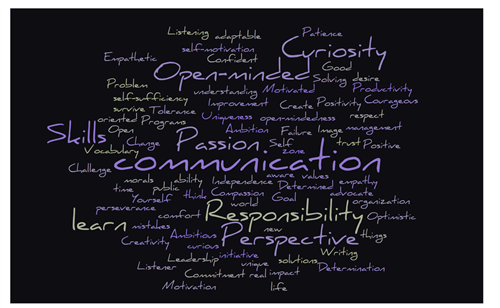 At the conclusion of their conversation, the students' responses were compiled into a wordle. The voice of our community stakeholders is vital to this process. 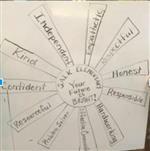 A virtual opportunity was created to for everyone in the Fraser Family to participate and provide feedback. 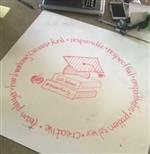 A survey was posted for several weeks, walking community stakeholders through the process to help refine what key skills and characteristics they felt graduates need. 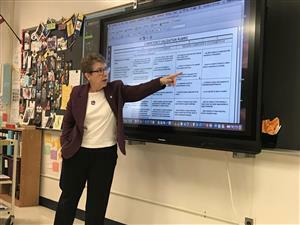 Rose Colby, a national expert on competency-based learning, came to Fraser for two days of meetings with district stakeholders. 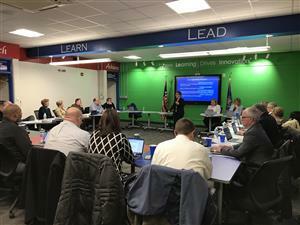 This included teachers and leaders from each building, plus administrators and the Board of Education. Consolidate the work, and present the Portrait of a Gradute and Strategic Plan to the Board of Eduation.